PUT your banners and picket signs down, everyone, you can stop your protesting — the war against homophobia has been won! Equality across genders and sexualities has finally been achieved! Wait, you mean you didn’t hear the news? 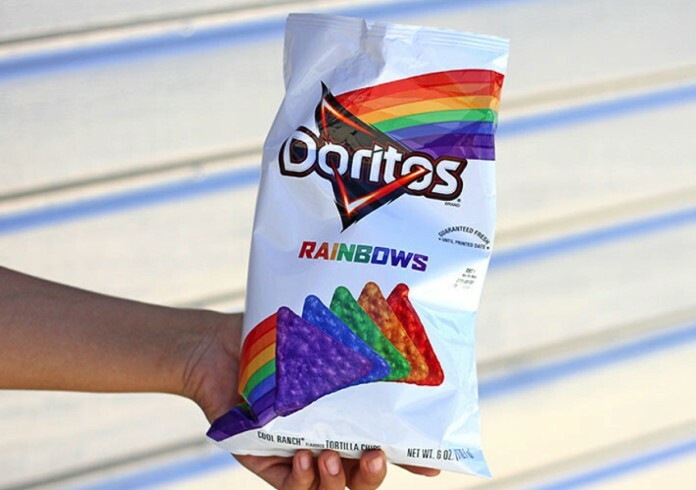 Oh well see, Doritos released a packet of corn chips in rainbow colours instead of the usual, I dunno, “corn” colour, and now homophobia doesn’t exist any more! Awesome, right? Oh, except of course that gay marriage is still illegal in Australia. And LGBT Australians have the highest rate of suicide in the nation, with up to 50 per cent of transgender people attempting to kill themselves at least once in their lives. And gay people can legally be discriminated against by their employers in most American states. And homosexuality is still either outright illegal or legally persecuted in more than 75 countries, including Russia, most of the African continent and parts of Indonesia. But rainbow coloured chips, you guys! Hooray! The new Doritos are only available in America, but that didn’t stop them being splashed across global media and gleefully spread across Facebook and Twitter as everyone celebrated the dawning of a new era of tolerant snacking. PR exercise, you say? Nonsense. Every bag raises money for the It Gets Better Foundation, a non-profit that aims to help LGBT youth overcome bullying. Except the new chips aren’t on sale in shops, you have to order them online. And they’re $10 a bag. Call me a cynic, but I reckon Frito Lay could have raised a lot more for the IGB Foundation if they’d just donated a portion of profits from the sale of their regular Doritos. But that wouldn’t get headlines now, would it? Gay people are still battling inequality on a massive scale worldwide but recently, in Western society at least, popular culture has embraced homosexuality as “cool”, and Doritos aren’t the only big brand to start cashing in on positive sentiment. The recent legalisation of gay marriage in America saw a tsunami of rainbows wash over social media as brands jumped on the bandwagon to “show their support” for LGBT rights. Facebook bathed profile photos in rainbow shades. Coke tweeted a picture of its bottles in rainbow colours. Fast food chain Chipotle posted a photo of a burrito wrapped in rainbow coloured foil. Cheerios, American Airlines and M&Ms all joined the rainbow revolution with tweets and Facebook posts designed to be shared and spread free advertising for their brand. Oh sorry, I meant “goodwill and equality for all”. Because sure, a cute picture in a tweet is enough. I mean, it’s not like these companies have masses of money they could, you know, be donating to organisations who might make an actual difference in making life better for LGBT people. On the one hand, public support and advocacy like this isn’t totally meaningless; when a cultural movement achieves enough momentum, it can lead to real results. But let’s not kid ourselves: the objective of any big brand is to make money, not change the world. If Coke and Doritos didn’t think adopting rainbow colours would enhance their image and sell more product, they wouldn’t do it. This year SA commemorates the 40th anniversary of the decriminalisation of homosexuality. Cause for celebration, certainly, but also for reflection; 40 years is not a long time. And let’s not forget it was still illegal in Tasmania up to 1994. So you’ll excuse me if I don’t crack out the Doritos for this party. Because a lot of things still have to be done for our LGBT brothers and sisters to get true equality, and buying chips isn’t one of them. First published in The Advertiser, September 26, 2015. Click here to read original article.